A boys' choir charity was turned down for Arts Council of Wales (ACW) funding because it did not provide enough opportunities for girls, assembly members have been told. Only Boys Aloud creator Tim Rhys-Evans said it cost £500,000 a year to run its 14 choirs but in its seven years only ever had £100,000 of public funds. He told the culture committee the lack of public sector support was "galling". An ACW spokesman said the arts were not "immune" to the pressures of austerity. 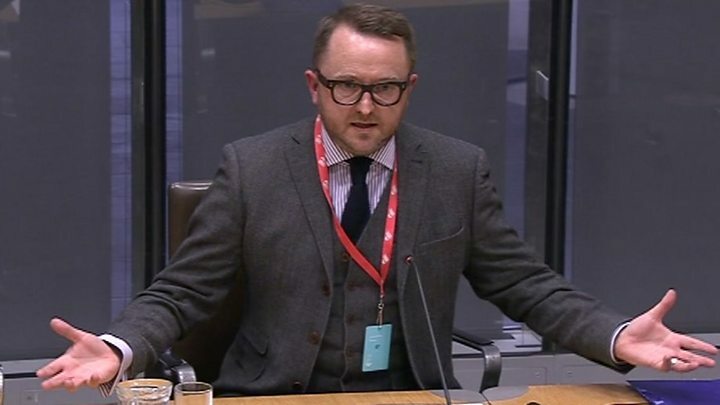 Giving evidence to an inquiry on public funding for music in schools, Mr Rhys-Evans said he wanted to create opportunities for boys in valleys communities such as New Tredegar, where he grew up. He explained how he launched Only Men Aloud as a way of keeping the male choir tradition alive after the decline of heavy industry. Only Boys Aloud was then created, he said, to attract boys who would not join a school choir, because of their family background or prevailing attitudes. "If a girl wants to sing, if a girl wants to dance, if a girl wants to act, that's fine", Mr Rhys-Evans said. "But if a boy wants to do the same thing, in this land of song ... then he's probably going to get a lot of stick." Mr Rhys-Evans said he was grateful to the businesses who had backed his charity with sponsorship, but said it was "galling" that he could not get more public funding. He revealed the Arts Council of Wales had rejected the Aloud charity's bid to become a revenue-funded client organisation. "We weren't after complete dependence on the public sector - we were just after a higher percentage than the very, very small percentage [we get], " he said. Quoting from the reasons for refusal, Mr Rhys-Evans said the council said it "entirely understands the genesis of the company and focus on boys" but "the lesser offer for girls, especially those in the older age group, does cause some issues". "People have lamented the fact you can't engage with boys ... it was our raison d'etre," he said. "So I find that difficult." An ACW spokesman said there had been "difficult choices" to make over limited funds, saying: "The arts have not been immune to the pressures of economic austerity. "Our revenue funding decisions, taken back in 2015, were effected by several years of reduction in funding. "Large number of organisations submitted bids for support in 2015, including the Aloud charity. "We did not have the funds to support everyone, and had to concentrate on those making the most persuasive case for support." The spokesman added: "We are extremely proud to have been able to provide over £70,000 to the Aloud charity since its inception; this is funding that has supported several projects including tours to the United States, training academies and the expansion of the choirs into north Wales." Mr Rhys-Evans also warned AMs that with cuts in school music provision, Wales had created an "elitist society" where only those youngsters whose families were supportive or well-off could realise their talent. In January, the conductor and Welsh Proms founder Owain Arwel Hughes told the committee he felt Wales' reputation as a musical nation was under threat from funding cuts. Is the Welsh tenor a dying breed?